My last post featured three quirky cave environments in France. You might think that would complete my postings on the French underground, but two more visits must be described: both with top ratings on the quirk-o-meter. The tiny village of Dénézé-sous-Doué , a village in the Loire region for which Wikipedia can find nothing to say except; “Its church and the attached cemetery have the distinction of being away from the village.” Really, the entry is just this one sentence! I have never been so disappointed by Wikipedia and Geez–are they ever missing something! Dénézé-sous-Doué is home to one of France’s most intriguing mysteries: La Cave aux Sculptures. After poking around a bit we found the non-descript entrance leading to steps down, down, down, deep under sleepy Dénézé-sous-Doué. This is only sign of business I saw in Dénézé-sous-Doué. Things are not exactly hopping in Dénézé-sous-Doué, at least not above ground! 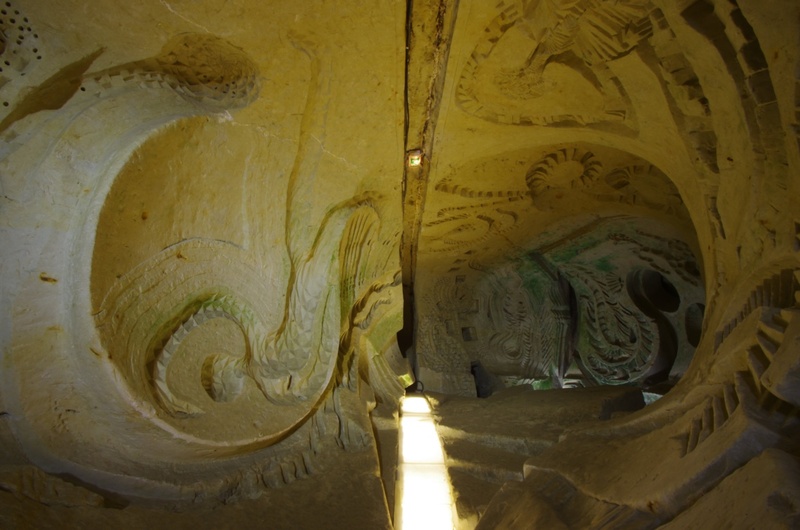 In front of us a 24 meter long, multi- chambered cave revealed itself , carved every inch with hundreds of bas-relief figures emerging from the walls. help date the sculptures to the 1500’s. One of the archaeologists dated the sculptures based on his observation that some of the female characters are wearing underwear (!! ), the practice of which did not take occur until the 1500’s. Oh, for close archaeological scrutiny! I did not discern any underwear but I don’t know if that tells you more about my observational skills or about the keen eye of the French archaeologist. I can tell you one thing though; given that the French word for “bra” is “soutien gorge”, which translates as “throat supporter”, I would say there’s a cultural divide between the American and French understanding of underwear. are a blasphemous representation of King Henri II (in the middle) with his wife, Catherine de Medici (depicted scandalously with her breasts exposed–no soutien gorge for her!) on the left, holding hands with Henri’s mistress, Diane de Poitier, on the right. This is not the only scandalous bit of carving. And several heads with no bodies and limbs strewn about and some devilish monsters that I was unable to photograph for lack of lighting. Incredibly there is even a sculpture of a Native American– the first known depiction of a Native American in Europe! Apparently there is documentation of a Native American who was brought to live in Anjou, France in the 1500’s so finding his likeness in this cave is not so far-fetched a notion. There’s plenty of Christian references, but they are loaded with parody. The customary figures in the sculpted Pieta– Mary, Joseph, Jesus– have been replaced by Catherine de Medici as Mary, holding her son, Francois II as Christ and the Cardinal of Guise sits in for Joseph. Mary Stuart as Ste Jeanne, looks on. It makes my head hurt to try to untangle the unseemly relationship between the French royals and the church during this period of the Religious Wars. If you’re determined to try to wind your way through this Gordian Knot, here’s a good synopsis that will help you. After dwelling in the ancient subterranean world of La Cave aux Sculptures my visit to the nearby site, l’Hélice Terrestre felt like futuristic travel to another planet. However l’Hélice Terrestre is just a few a few kilometers away in the village of Saint-Georges-des-Sept-Voies. As one would expect in troglodyte country, l’Hélice Terrestre (translation: Earth Helix) is underground, except, well, the part that’s NOT underground! Here’s a view from the highest point of the helix. And like any good troglodyte helix should, this helix spirals its way down, reaching deep into the bowels of the earth. L’Hélice Terrestre is the work of Polish sculptor, Jacques Warminski who had spent some of his childhood vacations in nearby l’Orbière, one of the last remaining Troglodyte villages in France. L’Orbière was completely abandonned in 1950, but kept alive in Warminksi’s imagination. It served as the inspiration for his life’s culminating work. Warminski created this mind boggling sculpture in four years time in the early 1990’s. It doesn’t seem possible that stone carving of this intricacy on this scale could have been accomplished just in four years, but unlike La Caves aux Sculptures, the dates for L’Hélice Terrestre are not in dispute. Jacques Warminski died in 1996 at the age of 50, just two years after completing L’Hélice Terrestre. Currently l’Hélice Terrestre is being maintained and kept open by Warminski’s widow, Bernadette Alberti and is used as a site for comtemporary art performances.